The 36-year-old teacher who, for the past five seasons has served beer at Safeco Field, is ready to take orders from fans in the stands. Send a message to his Twitter address, @Msbeervendor, your seat and your order and he'll be there as soon as he can. "Since the beginning of beer vendors, we've been walking up and down the aisles seeing who wants a beer, I'm going to try to change that," Zelko said. Zelko says he normally sells about 80 beers during an average home game from the beginning of the game until the first pitch of 8th inning, when he has to stop. On those days he pulls in about $125. On weekends, he can sell more than 100 beers and pull in closer to $200 - even more if the Yankees are in town. 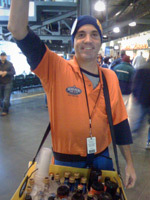 Throughout the season, Zelko - who currently has 224 followers - hopes to do something that no other beer vendor has done before: Grow a following, let fans into his life as a beer vendor and communicate with fans even when he isn't selling beer to them. People might think they know what it's like to sell beer, but Zelko says fans have no idea of the challenges. No one buys beer when Ichiro gets to the plate and the steps in the outfield stands are usually filled with Japanese girls crowding the aisles. Zelko says in order to be prompt, he'll probably check his phone every three aisles to see if if an order has come in. "I come from a family of stockbrokers," said Zelko, who teaches special needs children during the day. "Selling things is easy for us."